Today, both paths—escalating conflict and constructive cooperation—are distinctly possible, in the dam dispute as in the region as a whole. The risks of resurgent violence in eastern Africa, instability in Egypt, mass migration, and threats to key Red Sea chokepoints all suggest that the United States, Europe, and the international community have a stake in ensuring that actors on the ground and in the Middle East choose wisely. Since British colonial times, Nile countries’ water usage has been shaped primarily by a 1959 bilateral agreement between Egypt and Sudan, which provided Egypt with a large share of Nile water while excluding Ethiopia and other upstream nations. The latter have condemned the agreement, calling for what they consider a more equitable use of water, but attempts over the decades to negotiate a broader regional water management treaty have faltered. Despite the continuing dispute, Ethiopia began construction of the mile-wide GERD in 2010. For Ethiopian leaders in Addis Ababa, the Renaissance Dam is both a transformative state-led infrastructure project and a symbol of their national ambitions. The structure will be almost 500 feet high and 6,135 feet wide, with an additional saddle dam and a reservoir of nearly 800 square miles. Upon completion, the dam’s reservoir could hold up to 74 billion cubic meters—more water than Egypt absorbs in an entire year. Its 16 turbines will nearly triple Ethiopia’s current installed capacity to generate electricity and allow for major Ethiopian electricity exports to neighboring countries. Construction has been a long, arduous process, but, by most accounts, workers are set to start filling the reservoir and generating power within the coming year. Because the dam was funded through domestic financing and bond issues to Ethiopian diaspora communities around the world, the pressure to complete the project and generate export revenues is high. Ethiopia’s neighbor Sudan initially stood with Egypt in opposing any upstream dams, but its position on the project evolved as the dam’s potential benefits to its farmers became evident. Sudan experiences brutal seasonal flooding, which keeps it from using more than a meager 20 percent of its arable land, by one diplomat’s estimate. The GERD could allow Sudan’s eastern Gezira region to farm three seasons a year and would put the country’s own smaller hydroelectric Nile dams to work generating power—helping realize its long-standing potential as a breadbasket feeding its African and Arab neighbors. Sudan’s change of heart may also be due to its growing closeness with two of Egypt’s regional rivals, Turkey and Qatar. In addition, Ethiopia built the GERD less than 20 miles from Sudan’s border, thus assuring leaders in Khartoum that water would not be diverted from its path through their country. From an engineer’s perspective, one diplomatic official quipped, Ethiopia would generate the electricity, Sudan would plant the crops, and Egypt would drink the water. Needless to say, that formula doesn’t work for Egypt, which remains understandably wary of any shifts away from the status quo. The dam’s benefits for Ethiopia and Sudan are clear, but its consequences for Egypt are potentially dire. The quarrelling parties have alternated between bluster and pragmatic talks. A recent warm spell in relations has included a visit by Ethiopian Prime Minister Abiy Ahmed to Cairo, the reported release of 32 Ethiopian prisoners by Egypt, and plans to hammer out a joint vision for the Nile. This could signal progress toward resolution. But dueling nationalisms and fears of domestic instability constrain both sides. No concrete breakthroughs have been achieved nor details cemented on how many years Ethiopia will take to fill the dam, and the parties have moved forward before only to fall back into public recriminations. Despite past military threats, the prospect of outright war between Ethiopia and Egypt remains remote, and lower still given the recent diplomatic warming. For one, scholars suggest that outright water wars have rarely come to pass because transboundary water supplies create interdependence (bombing an upstream country that can divert your water supply is unwise). Moreover, water flow is rarely all-or-nothing, and a range of mutually beneficial technical solutions exist. Egypt, for its part, has sought to steer clear of regional adventurism, and its military would struggle to carry out a direct strike on the dam. Nonetheless, the stakes remain high. Much more likely than full-scale war is a destabilizing lapse into proxy fights in which each side cultivates local forces to aggravate the other’s pressure points. Egypt, for example, has been accused of training forces in Eritrea, which is only beginning to emerge from its prolonged conflict with Ethiopia (Egypt has firmly denied these reports). Egypt can also pressure Sudan via armed opposition groups operating in Darfur, South Kordofan, and Blue Nile. Sudan, meanwhile, has emerged as a haven for Islamist opponents of the Egyptian regime. All the relevant regional parties have also been competing for influence with differing factions in war-torn Somalia. In other words, the networks of proxies for countries to destabilize each other are already in place across the region. Further complicating things is the miniaturized great game that has emerged following the Middle East’s rediscovery of eastern Africa over the last decade, and the impacts this could have on the dam dispute. Arab attention to the Horn has been steadily increasing since Gulf countries began investing in African farmland after a sharp rise in global food prices in 2007. Heavily dependent on imports for their food security, Gulf states began a search for alternatives to global markets by acquiring fertile farmlands in sub-Saharan eastern Africa. Since then, Qatar, Saudi Arabia, the United Arab Emirates, and even Turkey have ramped up various forms of investment and engagement. As alliances shift rapidly with the infusion of resources and cash, one senior European diplomat described the process as “an outright scramble.” Outside players in the region “know that a little bit of money goes a long way. You dangle $50 million at someone who’s run some group, you’re changing a game completely.” The rapid and haphazard nature of this competition—characterized as “experimentation” by eastern Africa expert Annette Weber—has meant that this already fragile sub-region is becoming increasingly combustible. Gulf involvement escalated following the 2015 Saudi-led intervention in Yemen and the diplomatic rupture with Qatar in 2017. As a result, the Horn has become further militarized and regional actors now risk exacerbating local rivalries. At the same time, increased Arab involvement, especially the United Arab Emirates’ $3 billion aid pledge to assist Ethiopia, point toward the possibility of a break with past conflicts and a better path forward. Gulf attention is not the only reason for the influx of resources to eastern Africa. The United States, China, France, and others have also stationed troops there. But the region has taken on an outsized role in Gulf state’s strategic and defense planning. In November 2017, Saudi officials announced the opening of a military base in Djibouti. Eritrea’s Assab port has housed the United Arab Emirates’ first foreign military base since 2015, from which the Emirates project force into Yemen. Middle Eastern geopolitics have jumped the Red Sea, militarizing and polarizing the Horn of Africa. Meanwhile, Turkey and Qatar, strategic rivals of the Saudis and Emiratis with little prior investment in Sudan, have signed deals worth nearly $5 billion with Khartoum over the last year. The deals include plans to lease and develop an Ottoman-era Red Sea port on Suakin island, with talk of creating a naval docking area for both civilian and military use as Turkey’s third overseas military base alongside those in Qatar and Somalia. Turkey and Qatar have also invested heavily in the Somali central government. Recent reports suggest that Russia, too, is talking to Khartoum about a Red Sea naval supply center. The United Arab Emirates has been the most aggressive in expanding military cooperation in the Horn of Africa. Beginning in 2014, the Emirates began assisting the Somali government in training and developing its armed forces. Yet relations have soured in recent years, as the UAE accused the government in Mogadishu of being too cozy with its rivals Qatar and Turkey, while the Somalis suspected the UAE of supporting rival local forces. Cooperation came to a sudden halt in mid-April after Somali security forces seized $10 million of UAE money from an Emirati plane. The UAE, however, has cast a wide net and prioritized acquiring new regional partners over defending its foothold in Somalia. It recently pledged $3 billion in aid to Ethiopia and helped broker the country’s rapprochement with Eritrea—another recipient of Emirati largesse. Some have speculated that the UAE may use this newly acquired leverage over Ethiopia to ensure that the GERD is filled slowly, and a senior Emirati official confirmed this intention to one of the authors. This would avoid short-term water shortages in Egypt, protecting the far larger Emirati investment in the domestic stability of Sisi’s government in Cairo. Thus, as Middle Eastern geopolitics seeps into the region, it could in fact help steer the Nile dispute toward a diplomatic resolution. Recent Emirati peace-brokering is a promising development. If sustained, it would mark a more constructive path than the UAE and other regional players have pursued to date. An Emirati choice to prioritize knitting together local actors in its eastern African engagements over exporting Middle Eastern competition could significantly improve the prospects of peace in the region. Such an outcome, however, is far from a foregone conclusion. Absent coordination or reassurance among outside players, the risk of security dilemmas remains, pushing other actors to compete. Egypt, for example, has accelerated its naval modernization efforts and expanded military procurement even as it is fighting an intense military campaign against insurgents in the Sinai and imposing IMF-driven austerity measures. There is little doubt that this build-up is meant in part to solidify Egypt’s power in the Red Sea, where it recently established a Southern Fleet Command anchored by one of its French-made amphibious assault ships. Continued outreach and reassurance will be required to ensure that Ethiopian security officials do not interpret such steps as the realization of their long-standing fears of Arab encirclement. Valley where GERD shall harnass the White Nile. As Middle Eastern powers have stepped up their presence throughout the region, Western powers and international organizations have so far failed to leave their mark on the dam dispute. In recent years, the United States has taken a hands-off approach to the issue, its Middle East and North Africa policy trained instead on revolutions, civil war, and ISIS. These days, the space for U.S. engagement is also bounded by the Trump administration’s chaotic process and limited bandwidth. At a technical level, the European Union has proposed various solutions and the World Bank remains open to facilitating negotiations among the parties. Until recently, these efforts have hit a wall of mistrust, nationalism, regional rivalries, and a lack of high-level U.S. attention. But as the dam begins to fill, an abstract future threat becomes a daily reality to manage, and a period of contentious diplomacy lies ahead. For U.S. officials, flying under the radar and working at the technocratic level can be advantageous. But it can come at the cost of lacking high-level officials to pitch constructive solutions to foreign leaders. Should the United States engage more deeply, it could draw on long-standing ties to Egypt, increasing leverage over Sudan thanks to recent diplomatic openings, and sizable U.S. aid and security assistance to Ethiopia. The Trump administration’s internal challenges complicate matters, but the United States can and should be quietly and constructively advancing preventive diplomacy between the riparian states. The dam dispute presents unique challenges to U.S. policymakers. Issues that cut across regional expertise and functional turf and expertise can fall through bureaucratic cracks. 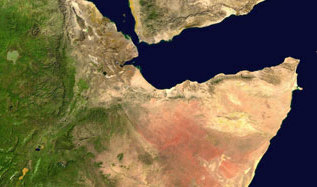 The Nile dispute spans Middle Eastern and African offices at the State Department and Pentagon, and also requires technical expertise in transboundary water disputes. Some State Department officials have made an admirable effort to bridge these fault lines and allow U.S. diplomats to present a united front in Cairo, Khartoum, and Addis Ababa. Such efforts—as well as clear, consistent support from leadership—are vital to ensure that the policy process is not distorted by clientelism or an overemphasis on political-military issues at the expense of functional expertise. The challenges that the dam dispute raises are sure to reemerge in other contexts. First, Arab-African ties are becoming more important. The Gulf countries, with their immense wealth but dwindling food supplies, are leading the charge. Meanwhile, the movement of terrorists and smugglers across the Sahel desert connecting the Arab Maghreb with sub-Saharan Africa has shown that tomorrow’s security problems are unlikely to fit neatly within existing U.S. bureaucratic lines. The question is not whether such Arab-African ties will deepen but whether they can deepen constructively—and how Arab engagement in northeast Africa will shift once the Yemen war on the other side of the Red Sea finally ends. Likewise, you do need not accept the argument that climate change helped fuel the Arab uprisings of 2011 to recognize that foreign policy challenges increasingly arise at the intersection of nature and national security, where climate change and other man-made environmental changes exacerbate diplomatic disputes. These hybrid challenges span not only the usually separate realms of Middle Eastern and African policymaking but also the traditional political-military concerns of regional experts and the functional expertise of hydrologists and engineers. From the potable water crisis in Gaza to the threat of a massive inland tsunami from a collapsing Mosul Dam derailing the fight against ISIS in Iraq, political leaders will increasingly have to craft processes that draw on the talents of a wider range of technical experts. As climate change accelerates and causes further displacement, there is every reason to believe to believe this trend will only intensify.